Railways can be dangerous to work. With large and heavy trains running on steel wheels, brake capacity is limited and trains cannot stop quickly if there is a hazard. The railway was amongst the first industries to recongnize that the safe passage of trains must be part of an accepted and understood safe system of work, and railway rules and byelaws quickly arrived to provide such a process and remain with the industry today. 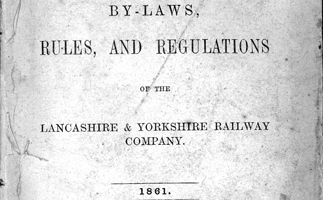 Railway rule books developed alongside the railways whose activities they governed. The earliest railways were open access affairs and the rules were largely there to promote good behaviour amongst their users. As railway companies developed into operators as well as carriers, the needs changed and rules came to promote safe methods of work. At first, each railway adopted its own methods. When railways began to interwork the need for standardization rapidly became apparent and standard codes of rules were developed, these standard rules were then managed on behalf of the companies by a central authority called the railway clearing house, and these standard rules were later adopted by British Railways. In recent years rule books have been shown to be wanting and new ideas have been developed more closely related to job function. This was found unnecessarily complicated and in 2003 a further approach was adopted, using 'plain English'. The development of railways byelaws and miscellaneous instructions is also covered, together with various standard sets of regulations. To download the article about rule books please click the button below. Please give the above download several seconds to arrive as it is a large-ish file. If you experience a problem using the button, there is an alternative link at the bottom of the page. Clicking the button will open a new window or tab.